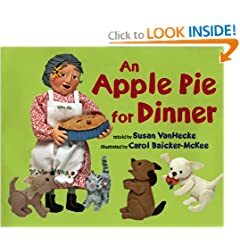 This month, for Barrie Summy's Book Review Club, I'm writing about An Apple Pie for Dinner retold by Susan Vanhecke and illustrated by Carol Baicker-McKee. This is my first "sponsored" review, by which I mean that the publisher sent me a copy of the book to review. At first I was excited! Then I was worried. What if I didn't like the book? Worse, what if my kids didn't like it? They're sort of "off" new things, lately. And they each definitely have favorite books they like to read. Over. And over. And over. We have three bookcases, each with 3-4 shelves, stuffed full of children's picture books and board books. Additional children's books are stashed on bedside tables, busy bags in the car, and beside nearly every chair in the house. (Adult books are largely confined to the floor-to-ceiling bookcases in the basement and one small bookcase in Paul's and my bedroom.) We are readers. But we are very opinionated readers. So I introduced An Apple Pie for Dinner with some trepidation. Our first time through the new book, Ada (age 2-1/2) and Ellie (age 6) listened quietly then requested Where the Wild Things Are. The second day, I included An Apple Pie for Dinner in my stack of suggested books for naptime (Ada) and bedtime (Ellie). They both picked it first. And we've read it at least once a day all week. This is a rousing endorsement, indeed! But what do they actually like about the book? Is it the illustrations? The story itself? The idea of the quest? I asked Ellie, who walked away shaking her head. I asked Ada, who also looked at me like I was crazy. "Apple pie. For dinner." So let me tell you why I like the book, instead. Carol Baiker-McKee created three-dimensional, mixed-media bas-reliefs to illustrate this book. Carol explains: "Mixed media is just a fancy way of saying that I created the artwork from lots of things, including fabric scraps sewn into clothing, embroidery, baked polymer clay, pipe cleaners, pieces of wood, and interesting things rescued from the trash and bought at rummage sales." The art makes the book worthwhile, all by itself. But the story is great, too. It's based on an old English folktale (The Apple Dumpling) which might be why the plot seemed slightly familiar to me. But I'd never heard the story told quite this way. Granny Smith wanted to make apple pie, and she had everything she needed, except apples. She did, however, have plums. So she packed a basket full of plums and set off to find someone who wanted plums and had apples. Instead, she found a woman who wanted plums but had feathers. And so it went until Granny finally found a man with an apple orchard who just happened to need what she had in her basket at the time. I don't want to spoil the ending, but the story winds up with every character in the story eating apple pie for dinner at old Granny Smith's house. 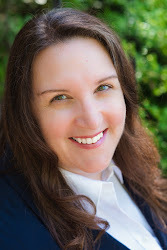 Click on over to the author's website to see some of the artwork and decide if a journey through the book isn't worthwhile, even knowing that there's a Happily Ever After ending. I'm still having fun after twice daily readings for a week. Our current challenge is to find all the hidden ladybugs. Because a good children's book entertains the reader as well as the listener and this one does that. I eat a delicious piece of apple pie for dinner last night.In america most of people likes the apple pie their favorite pie flavor.It's good to take apple pie with dinner for our health.